Can you believe it is already December, and the count down to Christmas has begun! I promise myself each year that I WILL be ready for Christmas. That I will plan and organize and prepare. I don't know what happens between January 1 and December 1, but somehow all of my promises go by the wayside and I am rushing to get ready. I think my main problem is that I am easily distracted by shiny objects. The attached card was not part of my plan for December, however, when I saw the challenge at Techno Stamper http://technostamper.blogspot.com/2009/11/monday-lunchtime-sketch-challenge-98.html I decided to play. 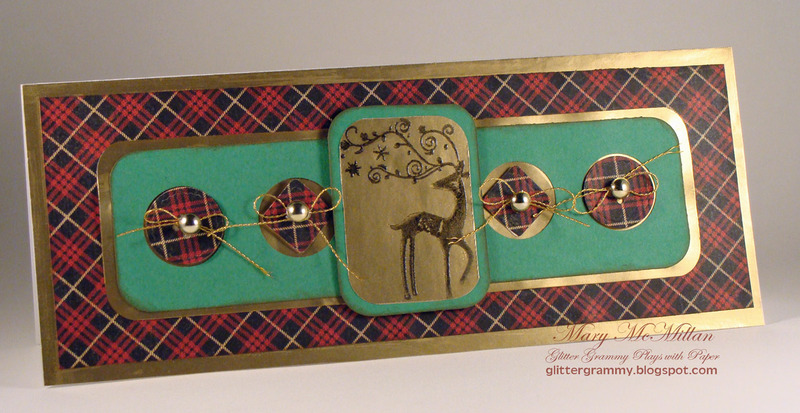 All the card stock used for this card are from my scrap bin. I love when I can make a card using something I've saved from another project. The stamp is from Stampin Up. She is the newest stamp in my collection. 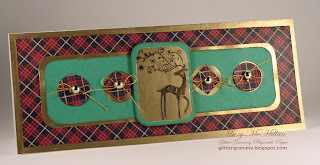 The button embellishments are also from Stampin Up. The are die cuts. The buttons were tied with gold thread and Dew Drops were added. I hope you enjoyed the card I enjoyed making it. I wish you a wonderful day. If nothing shiny catches my eye....I may actually get my check book balanced!